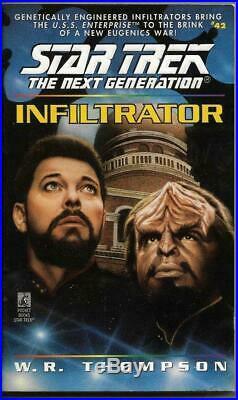 Original art to the cover of the Star Trek: the Next Generation book, Infiltrator (1996). The cover was painted by Keith Birdsong, who is perhaps the most famous and prolific artist for licensed Star Trek items. He painted the artwork to Star Trek collector plates, novels, and video game boxes, among other items. 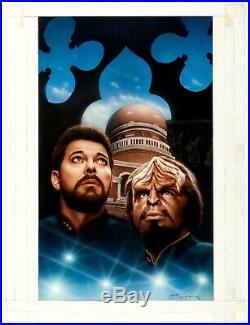 The painting has amazingly accurate images of Worf and Riker, who were main characters in this novel about the followers of Khan. Art is in excellent condition with an image area of 11" x 18". The item "Keith Birdsong Star Trek Next Generation ORIGINAL ART book cover TNG Riker Worf" is in sale since Wednesday, April 3, 2019. This item is in the category "Collectibles\Science Fiction & Horror\Star Trek\Next Generation". The seller is "benkin" and is located in Staten Island, New York.